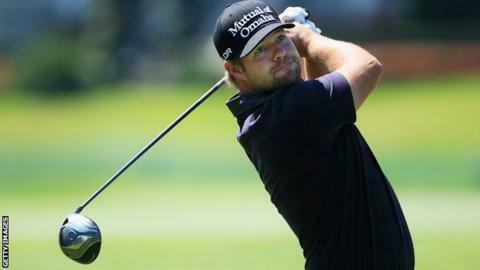 Ryan Moore potentially scuppered his Masters chances by winning the traditional par-three tournament on the eve of the competition at Augusta. The 31-year-old American finished six under around the picturesque nine-hole layout on the banks of Ike's Pond. Kevin Stadler, son of 1982 Masters champion Craig Stadler, and 1979 winner Fuzzy Zoeller were second, four under. In its 53-year history, the competition winner has never gone on to clinch the Green Jacket in the same year. Two players have won over the short course - a relaxed family affair with children, family and friends donning the white caddie suit - and finished second in that year's Masters, Raymond Floyd losing a play-off to Nick Faldo in 1990 and Chip Beck finishing runner-up to Bernhard Langer in 1993. When asked about the "curse" of the par-three winner, Moore said: "I'm not afraid of it. You never know, someone has got to break that curse at some point in time, so hopefully it's me. "It was fun having my boy out there and playing a round with a couple of friends. That's what it's for, to kind of make you relax a little bit and just go and enjoy yourself the afternoon before." Rory McIlroy had fiancee and former world tennis number one Caroline Wozniacki acting as his caddie for the second year running. The holes on the 1,060-yard par-three course range from 90 yards to 140 yards.